The AKCP sensorProbe2 monitoring system is a compact, yet versatile, 2 port sensor device. Ideal for monitoring environmental variations, power, physical threats and security. An embedded Linux like operating system and TCP/IP stack makes the unit platform independent and accessible via a LAN or WAN. Full SNMP compliance and the supplied MIB gives easy integration with network management software. The AKCP sensorProbe2’s advanced encrypted micro code updating program facilitates firmware upload via the internet. 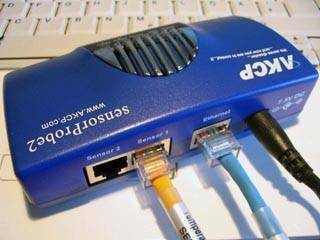 Using AKCP’s probe manager software tool, upgrade the firmware to multiple SP2 units in your LAN in one click. It does support other sensors which can monitor voltage drop, security, analog and dry contacts. It is customizable to any other sensors like Motion, Gas and Sound Sensors. A wide range of our intelligent sensors are supported. Plug any sensor into the sensorProbe2 and our autosense feature will recognize the type and automatically configure it. The sensorProbe2 monitors your equipment’s environmental variations, and notifies you through “Email or SNMP Alerts in your Network Management system” in advance and prevents any disaster. The user-friendly web interface allows you to monitor and control the sensorProbe2 from anywhere remotely. It also provides you the graphical representation of environmental conditions. sensorProbe2 has been tightly integrated with Network Management Systems like HP Openview, CA TNG Unicenter, IBM Tivoli and WhatsUp Gold. Being kept up to date and alerted to changes in environmental or security conditions is vital in mission critical situations. 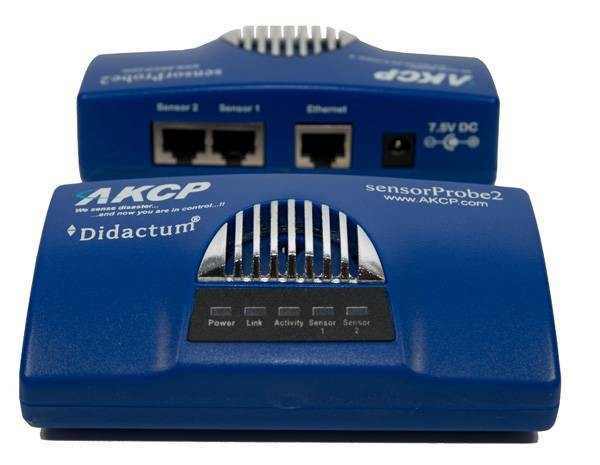 The AKCP sensorProbe2 monitoring system has facility to send E-mail or SNMP trap notifications. SMS is also supported by use of a third party gateway. Notifications are easy to configure using the web interface. Set the thresholds for the sensor parameters and when the maximums are exceeded receive instant alerts. E_10188 AKCP sensorProbe2, EU version with external power supply. Manual, MIB file and SNMP tools on CD. Sensors not included in the package.